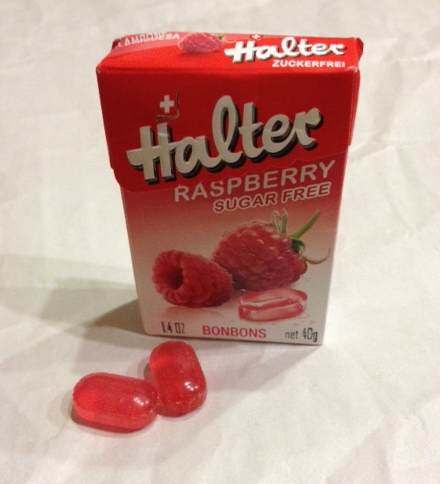 Halter Raspberry Bon Bons hail from Switzerland, and like all things Swiss, they exceed expectations in a quiet way. 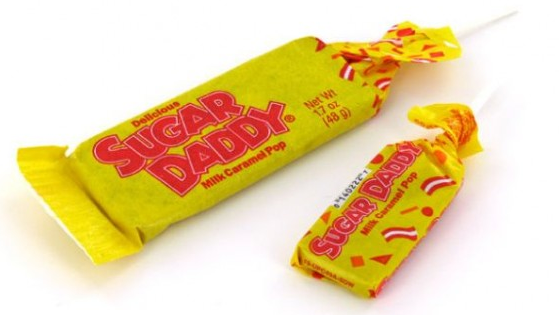 First off, they are sugar-free, but they are delightfully sweet with no strange, fake taste. Secondly, the package has a pleasant flip top. 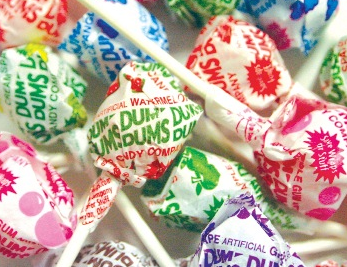 Third, they are called Bon Bons, and who doesn’t love that term? Lastly they’re Kosher and list the Rabbi who supervises the production. 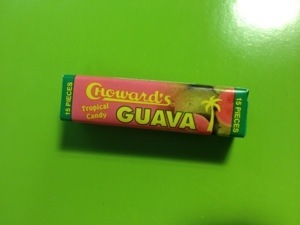 I spotted these in a wonderful drug store, in La Jolla, that carried everything including imported candies. The store is called Burns Drugs and it’s the kind of place that you could spend hours finding things that you didn’t know that you needed. 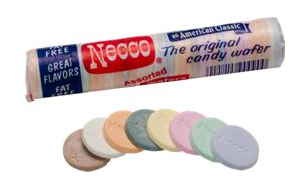 Even so, their candies are charming and are worth a try when you spot them on a shelf. 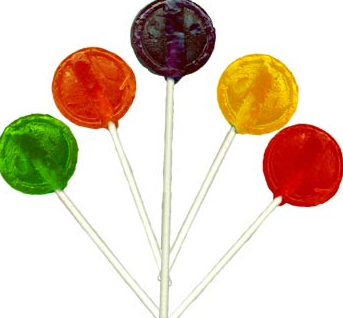 Posted in Fruity, Hard Candy, Sugar-free and tagged Bon Bons, Burns Drugs, Sugar-free. Bookmark the permalink. Now that’s a candy bowl! Ooooh look what greeted me at the entrance to L’Hosteria restaurant in Aspen. 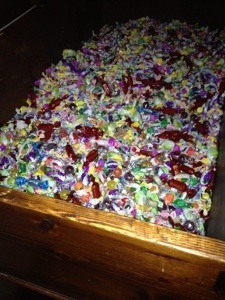 A wooden trunk 5 feet long and 2 feet deep filled with Italian hard candies. It was all I could do to keep myself from diving in! Posted in Hard Candy. Bookmark the permalink. 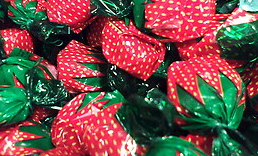 There is something so satisfying about making a fast batch of candy from stuff you have in the cupboard. I love coffee and I really love toffee, so this looks as if it was made just for me! This recipe comes to us from The Smitten Kitchen Cookbook. This is my latest cookbook obsession, and every recipe is inspired and written with easy to follow instructions, plus great photos. I reccomend it to give as a gift to yourself. Back to the Coffe Toffee…I checked all of the ingredients and came up short on semi sweet chocolate chips due to my kids eating them like candy, so I used some left over Hershey Kisses from Valentines Day. They worked perfectly. 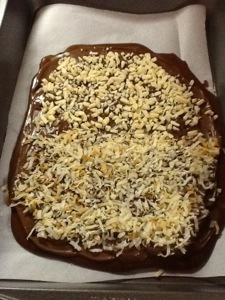 I thought I’d try toasted coconut on half of the toffee since I really don’t love nuts, and the coconut worked, too! 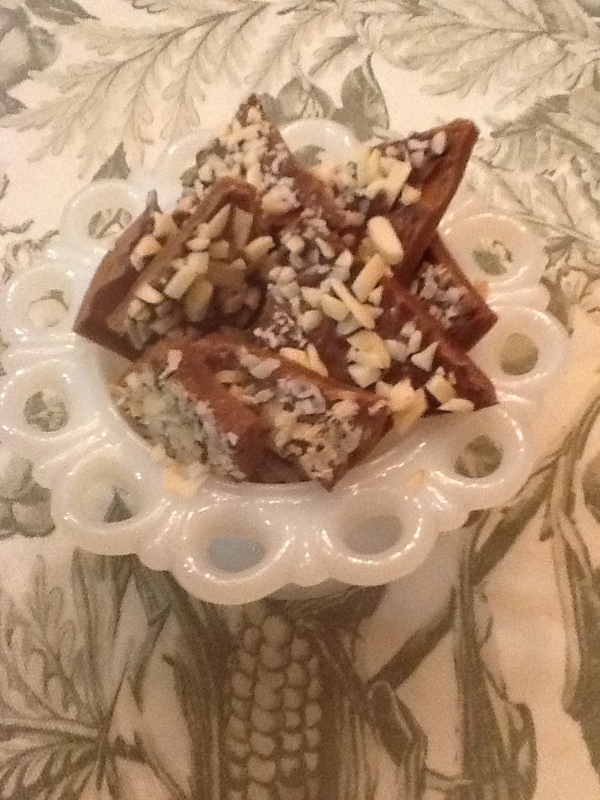 The coffee flavor is subtle, and gives a nice variation to sweet toffee. 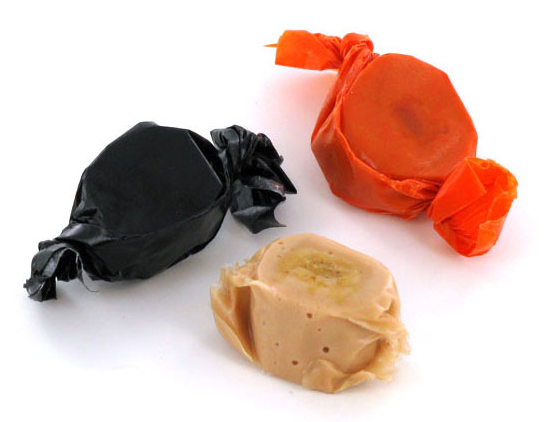 Here’s what I learned: The candy mixture cooks quickly, so don’t leave it unattended. 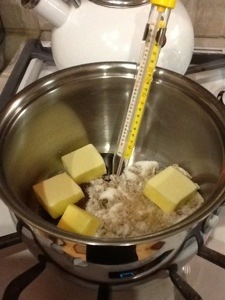 Start stirring it constantly the minute it reaches 250 degrees, it will zoom to 300 degrees in a matter of minutes. When pouring the cooked mix into the pan, take care not to pour any scorched sugar from the side of the sauce pan into toffee. 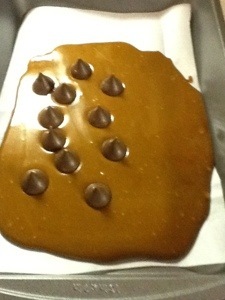 Have the chocolate chips ready to go onto the hot candy as soon as it is poured into the pan. 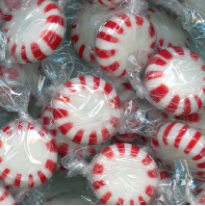 If you use Hershey Kisses, it takes about 2 dozen, and have them unwrapped before you start the recipe. Cool the pan in the refrigerator for about an hour. Store candy covered in the refrigerator to keep chcolate from getting soft. Next day update…even better flavor after sitting overnight in the fridge! Half coconut and half slivered, chopped almonds. Note how the toffee didn’t fill the whole pan, which made for easier clean-up. Posted in baking, coconut, crunchy, Hard Candy, Milk chocolate, references, recipes and tagged dessert, food, hershey kisses, sweet toffee. Bookmark the permalink. Look what my friend Rebecca brought me from T.J. Maxx this week. 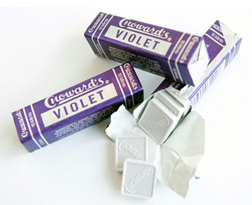 Hammond’s is a stellar candy company in Denver. There’s a kiosk at the Denver airport which I always visit when I’m flying through. 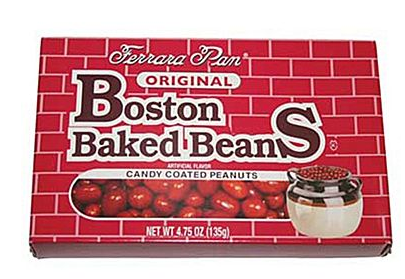 They’ve been making treats for 92 years, and all of their candy has that old- timey, handmade feel, and taste, while at the same time looking totally contemporary. Their candy canes are amazing. 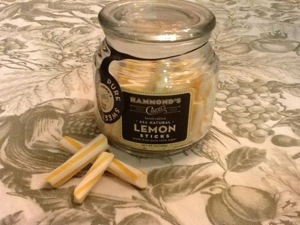 These lemon sticks are a nice balance of tart and sweet. I like to break them up into small pieces. They’re sweet enough that one stick at a time is satisfying. 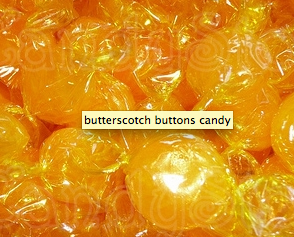 They have stripes on yellow hard candy twisted over white, so pretty that I could see them as a lemon drop garnish. Look for them the next time you’re in Denver (or at T.J. Maxx).